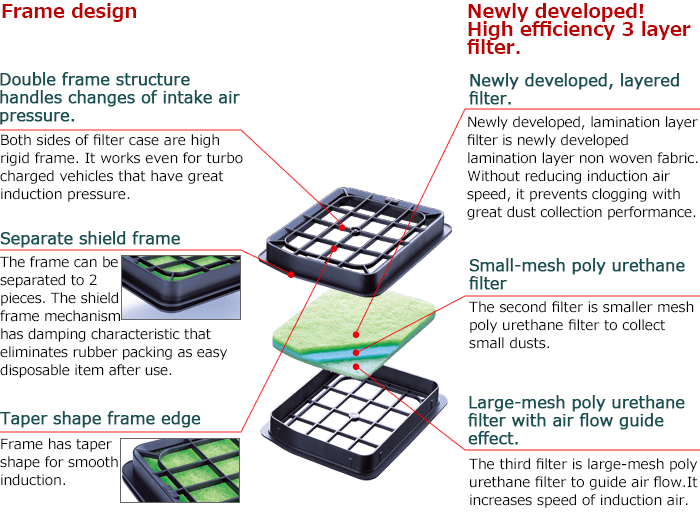 3 layered filter divides, collects intake air and smoothes air flow. It enables quick response that is required for sport filter. Newly developed Non-woven fabric is the first layer that collects large dust. Second layer polyurethane filter collects small dust. Thus the new filter has longer life. Joining of each layer was changed from flame lamination to net type joining that does not affect intake air flow. Dry 3 layer structure enables lower resistance. With high strength double frame, strong frame can be used for high horsepower. Shape of re-designed top frame enables smooth air flow. Separate shield frame is cushion type that does not require rubber gasket and easily disposable after use.